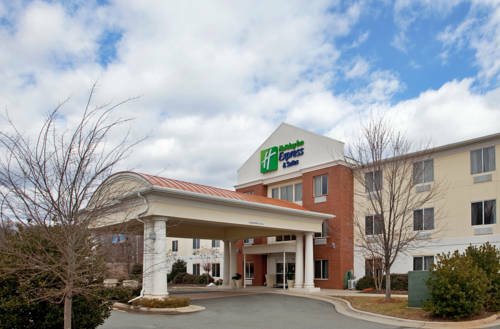 Our Mebane Hotel's Property Offers Choice AmenitiesConveniently situated along I-85 and I-40, our Mebane, North Carolina hotel's location provides easy access to Elon University, Duke Medical Center and UNC Chapel Hill. The staff of the Holiday Inn Express Mebane hotel is proud to offer you great perks like a free breakfast with a touch of Southern hospitality.Corporate travelers who stay at our hotel's facility in Mebane, NC are pleased to learn that we are near area businesses, such as Kidde Safety, Sandvik, Kingsdown and Delta Contracting. We also offer a spacious meeting room that can seat up to 60 guests. In addition, guests can catch up on work outside of the office in our Business Center with copy, fax and print services.When you stay with us in Mebane, North Carolina, our hotel's property provides a location close to the best area attractions and activities. You can enjoy a day of shopping at Burlington Outlet Village or go see a Duke or UNC basketball game. The North Carolina Zoo and Wet 'n Wild Emerald Pointe Water Park are also just a short drive away and make great destinations for a day trip!If you're looking for hotels in Mebane, NC, stay with us and benefit from amenities like free high-speed, wireless Internet access throughout the hotel and a complimentary breakfast bar. We also have an on-site Fitness Center and a beautiful outdoor pool to help you workout. "Stay Smart" by booking your reservation today.